TAG Heuer, a Swiss luxury watch brand and Automobili Lamborghini, an Italian luxury automobile brand, have announced a partnership to create a limited edition luxury phone. Called the TAG Heuer MERIDIIST Automobili Lamborghini, only 1,963 of these quad-band Bluetooth phones will be sold worldwide. The number is a tribute to the year that Lamborghini was founded. 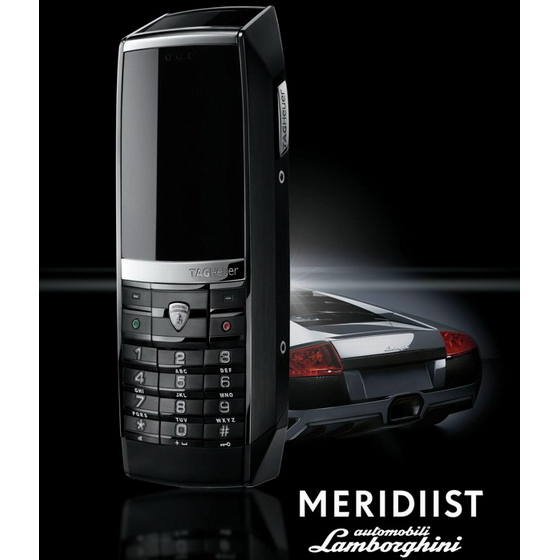 The inspiration for the phone’s design comes from the Murcielago (which means “bat”) by Lamborghini; one of its sleekest, fastest and most exclusive cars. The phone measures about 4.5 inches by 1.8 inches, has an above-average battery life: seven hours of talk time or 28 days of standby power. Standard cell phone features include a WAP 2.0 Web browser, a 2-megapixel camera, and 2GB of internal memory. 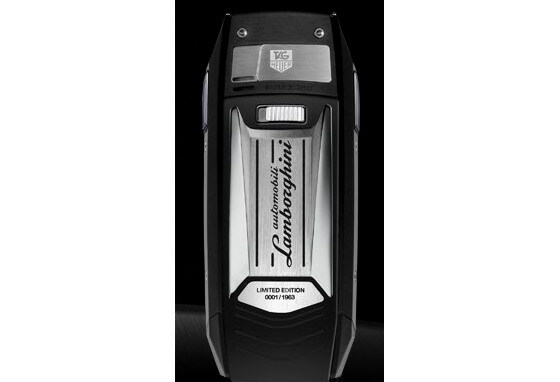 The handset is made from “black titanium carbide coated 316L stainless steel” and has the Murcielago signature on the battery cover, which is similar to the one seen on this car’s LP 640’s V12 engine block. The case is made from brushed stainless steel (a metal often used in TAG watches) and has a “backlit mechanical stainless steel keypad customized with Automobili Lamborghini’s trademark Taurus bull on the steel central button.” The display is made from scratch resistant sapphire crystal, another common feature of luxury watches. The phone is built by ModeLabs. As of now, you can reserve one of these new phones through select TAG Heuer and Lamborghini retail locations. It comes in different colors of real leather or alligator skin, but so far there is no price listed. Hopefully, it’s closer in price range to a TAG Heuer watch than a Lamborghini! You can learn more about this phone on TAG Heuer’s official website.